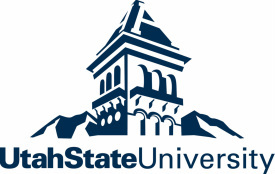 The element N is essential to all life, being a key part of proteins and DNA. 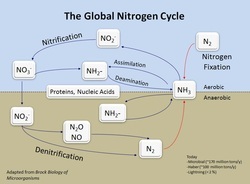 The element N is part of a global cycle (shown), with the conversion of N2 to NH3 being the largest input of N. The reduction of N2 to NH3 is called "nitrogen fixation" and occurs in the industrial Haber-Bosch process and in bacteria. In bacteria, this reaction is catalyzed by the enzyme nitrogenase. 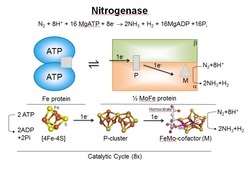 Nitrogenase consists of two proteins, called the Fe protein and the MoFe protein (shown). Each of these proteins contains metal cluster active sites, called the [4Fe-4S] cluster, the P cluster, and FeMo-cofactor. Research in the laboratory is aimed at understanding how electrons and protons are delivered to the FeMo-cofactor, where N2 binds and is reduced, and in understanding how N2 binds and is converted to NH3. 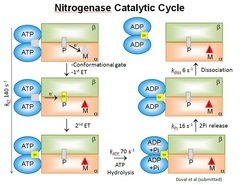 Recent progress in the laboratory has revealed several key aspects of the nitrogenase catalytic cycle including the fact that electron transfer is conformationally gated, and that ATP hydrolysis occurs after the electron transfer (shown). An area of active research in the group is understanding how N2 binds to the active site FeMo-cofactor and the intermediates involved in N2 reduction. 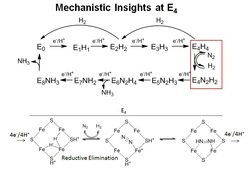 Recent progress has revealed that the key intermediate where N2 binds (called E4 state) contains metal hydrides. A reductive elimination mechanism has been proposed that explains the stiochiometric loss of H2 upon N2 binding (shown).